Here you are, a new mom, and you have your brand new baby home for the first time. Your beautiful baby loses the redness he had at birth and is really starting to get cute. Are those Daddy’s eyes? Grandma’s chin? And my – acne? You can’t believe it. How can your beautiful newborn have acne? Don’t worry. For the most part baby acne is harmless. Read on for the dos and don’ts of baby acne. Baby acne can appear shortly after birth and last until about six months old. The most common time for this skin condition is three to six weeks old. 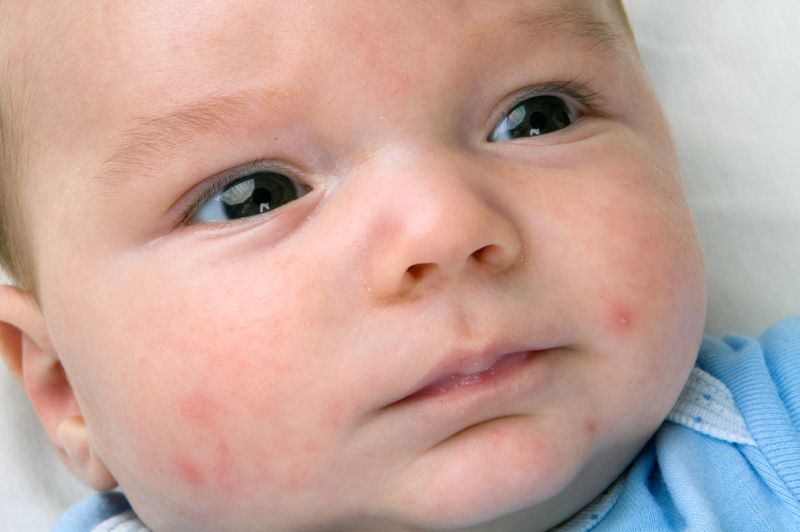 Baby acne can look similar to teenager acne, and appear as red and yellowish bumps on the face. If a baby also has cradle cap around the nose and eyebrow areas, a baby’s face can look rather red. Don’t worry – that’s normal. What causes baby acne? First of all, acne in adults, teenagers, or babies is influenced by common factors such as oils, bacteria, and hormones. It is thought that the mother’s lingering hormones, along with the baby’s oils, drive baby acne. This is why baby acne is worse during their first month of life. Don’t try and scrub away the acne. Physical scrubbing can actually create more aggravation and more redness. Don’t use over-the-counter adult acne medications such as benzoyl peroxide. These adult topical products may cause significant irritation to a baby’s skin that lead to more redness and worsening of the condition. Don’t stop breast feeding thinking that will help settle a baby’s acne issue. Continue breast feeding as usual. Don’t worry about scarring. Baby acne rarely causes any significant cosmetic issues and usually resolves gradually on its own. Do continue with gentle cleansing on the baby’s face without soap. Instead, use a soft baby washcloth around the eyebrows and nose. If desired, a gentle cleanser such as Baby Pibu’s tear-free Bathtime Wash can be used with your fingers, taking care to avoid the eyes. Do use over-the-counter 1% hydrocortisone cream twice daily for one day to reduce the redness. This can be especially important if there is an important photo opportunity or visit from family or friends. Do not use the hydrocortisone for more than one day. Do know that baby acne will resolve on its own and may last for a few weeks. Do know that other conditions such as cradle cap and eczema on the face can make baby’s acne appear much worse than it is. Know that this is ok.
Lastly, breathe easy. Baby acne is a relatively harmless condition. And while it might make cute photos more difficult, it should clear up on its own in a short period of time.